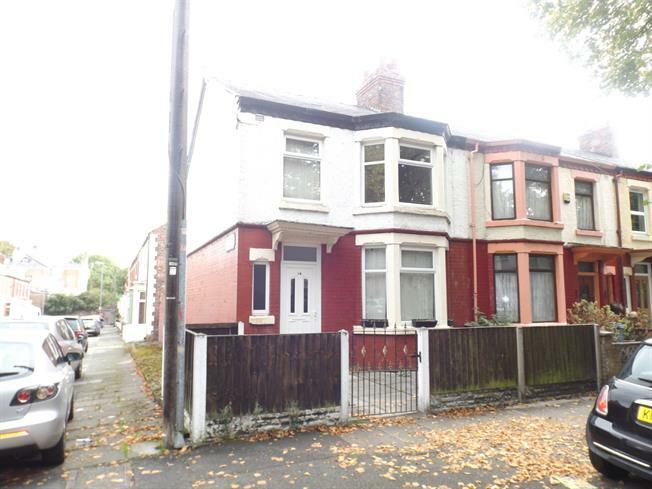 3 Bedroom End of Terrace House For Sale in Liverpool for Offers Over £100,000. Located in the popular L6, near to Newsham Park, with transport links to Liverpool City Centre. This three bedroom end terraced has great potential, suitable for families or investment. Briefly comprising of entrance hall, two reception rooms and kitchen to the ground floor. Upstairs there are three bedrooms and a family bathroom. Offered with no chain please contact 0151 220 4443 to arrange a viewing. UPVC front double glazed door. Double glazed uPVC window. Radiator, laminate flooring. Double glazed uPVC bay window. Radiator and gas fire, laminate flooring. UPVC back double glazed door. Double glazed uPVC window. Laminate flooring. Roll top work surface, wall and base units, stainless steel sink and with mixer tap, integrated, electric oven, integrated, gas hob, over hob extractor. Double glazed uPVC bay window. Radiator, fitted wardrobes. Double glazed uPVC window. Heated towel rail, tiled walls. Low level WC, panelled bath, shower over bath and electric shower, pedestal sink and wash hand basin.